AAHKS has made it easier for you to refer your patients to the patient education website for peer-reviewed articles and videos created especially for patients by the Patient and Public Relations Committee. 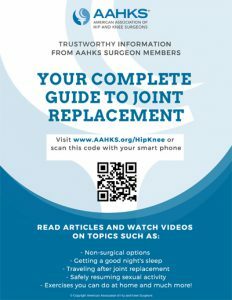 A new flyer includes the website address, scannable QR code and a sampling of some of the many topics covering total joint replacement. Download, print and include the flyer in your patients’ take-home materials. Feel free to share the flyer with your institutions and peers! Preview and download here.